The Arthur Press has always been a company that is responsible for the environment. All our waste has been recycled whether it being paper, plastic, printing plates, chemicals. The printing ink and chemicals that we are using are environment friendly products. In 2009, The Arthur Press decided to go one step further by sourcing our paper from well managed forest that is responsible and follow a responsible forest initiative. The major governing body that monitor and police these initiatives is FSC® (Forest Stewardship Council®). 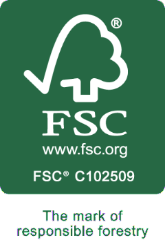 We are certified for FSC®. These certifications provide our customers with the right options for the drive towards a more environmentally responsible initiative.